Hiring? Toptal handpicks top web developers to suit your needs. We will also be using Angular.js to bring a bit of structure to our application; therefore, basic knowledge of the framework is a prerequisite. You should also install the following libraries to help you build up your application: Angular.js, Bootstrap, and jQuery. Probably the easiest way to install these is via Bower. As mentioned, the requestMIDIAccess method returns a promise, passing an object to the then method, with two properties: inputs and outputs. In earlier versions of Chrome, these two properties were methods allowing you to retrieve an array of input and output devices directly. However, in the latest updates, these properties are now objects. This makes quite a difference, since we now need to call the values method on either the inputs or outputs object to retrieve the corresponding list of devices. This method acts as a generator function, and returns an iterator. Again, this API is meant to be part of ES7; therefore, implementing generator-like behavior makes sense, even though it is not as straight-forward as the original implementation. We bound this select box to a $scope variable called activeDevice which we will later use to connect this active device to the synth. The WebAudio API allows us to not only play sound files, but also generate sounds by recreating the essential components of synthesizers such as oscillators, filters, and gain nodes amongst others. 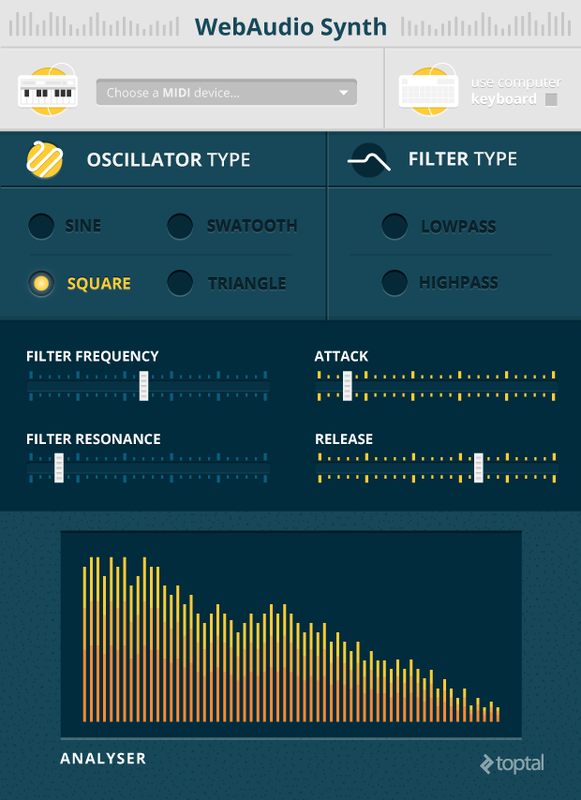 The role of oscillators is to output a waveform. There are various types of waveforms, amongst which four are supported in the WebAudio API: sine, square, triangle and sawtooth. Wave forms are said to “oscillate” at a certain frequency, but it is also possible for one to define their own custom wavetable if needed. A certain range of frequencies are audible by human beings - they are known as sounds. Alternatively, when they are oscillating at low frequencies, oscillators can also help us build LFO’s (“low frequency oscillator”) so we can modulate our sounds (but that is beyond the scope of this tutorial). We need two more components to complete our basic audio engine: a multipass filter, to give a bit of shape to our sound, and a gain node to control the volume of our sound and turn the volume on and off. To do so, we can proceed in the same way we did for the oscillator: create services returning a function with some wrapper methods. All we need to do is provide the AudioContext instance and call the appropriate method. Now we are almost ready to build our synth interface and connect MIDI devices to our audio source. First, we need to connect our audio engine together and get it ready to receive MIDI notes. To connect the audio engine, we simply create new instances of the components that we need, and then “connect” them together using the connect method available for each components’ instances. The connect method takes one argument, which is simply the component you want to connect the current instance to. It is possible to orchestrate a more elaborate chain of components as the connect method can connect one node to multiple modulators (making it possible to implement things like cross-fading and more). In the noteOff method, we first start by finding the note in the array of active notes and removing it. Then, if it was the only note in the array, we simply turn off the volume. The second argument of the setVolume method is the transition time, meaning how long it takes the gain to reach the new volume value. In musical terms, if the note is on, it would be the equivalent of the attack time, and if the note is off, it is the equivalent of the release time. First, we create a scriptProcessor object and connect it to the destination. Then, we create the analyser itself, which we feed with the audio output from the oscillator or filter. Notice how we still need to connect the audio output to the destination so we can hear it! We also need to define the gradient colors of our graph - this is done by calling the createLinearGradient method of the canvas element. We now have a nice visualiser which allows us to display the waveform of our synth in real time! This involves a bit of a work to setup, but it’s very interesting and insightful, especially when using filters. At this point in our MIDI tutorial we have a pretty cool synth - but it plays every note at the same volume. This is because instead of handling the velocity data properly, we simply set the volume to a fixed value of 1.0. Let’s start by fixing that, and then we will see how we can enable the detune wheel that you find on most common MIDI keyboards. If you are unfamiliar with it, the ‘velocity’ relates to how hard you hit the key on your keyboard. Based on this value, the sound created seems either softer or louder. And that’s it! Now, when we play our synth, we will notice the volumes vary based on how hard we hit the keys on our keyboard. Most MIDI keyboards feature a detune wheel; the wheel allows you to slightly alter the frequency of the note currently being played, creating an interesting effect known as ‘detune’. This is fairly easy to implement as you learn how to use MIDI, since the detune wheel also fires a MidiMessage event with its own event code (224), which we can listen to and act upon by recalculating the frequency value and updating the oscillator. The default detune value is 64, which means there is no detune applied, so in this case we simply pass the current frequency to the oscillator. So far, we only created a select box to be able to select our MIDI device and a wave form visualiser, but we have no possibility to modify the sound directly by interacting with the web page. Let’s create a very simple interface using common form elements, and bind them to our audio engine. We should define a few methods to bind these controls to our audio engine. For the filter, we need three controls: one for the filter type, one for the frequency and one for the resonance. We can also connect the _connectFilter and _disconnectFilter methods to the value of the checkbox. A lot of concepts were covered in this MIDI tutorial; mostly, we discovered how to use WebMIDI API, which is fairly undocumented apart from the official specification from the W3C. The Google Chrome implementation is pretty straight forward, although the switch to an iterator object for the input and output devices requires a bit of refactoring for legacy code using the old implementation. As for the WebAudio API, this is a very rich API, and we only covered a few of its capabilities in this tutorial. 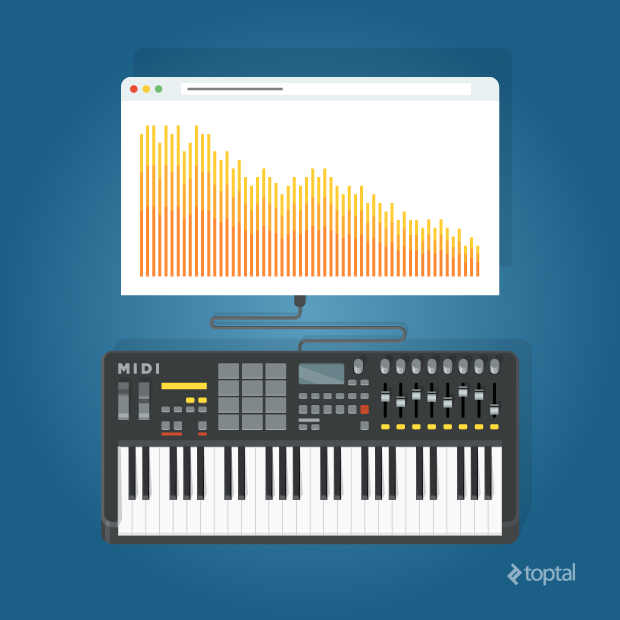 Unlike the WebMIDI API, the WebAudio API is very well documented, in particular on the Mozilla Developer Network. The Mozilla Developer Network contains a plethora of code examples and detailed lists of the various arguments and events for each component, which will help you implement your own custom browser-based audio applications. My head is going to explode, this so f*** great. This is awesome. I'm taking a class in college on Software Applied to Media and my professor is definitely going to hear about this! Look Great ! Wanna try it... but, when i'm trying the live demo, with a simple keyboard, nothing happens... any idea ? Sweet! I was just thinking about this the other day. Perhaps I'll have some time to create something cool with this. This is great stuff... except it's a bad idea, and unnecessary, to use a ScriptProcessor's onaudioprocess to call an analyzer's getByteFrequencyData - you should call that from within a requestAnimationFrame callback. 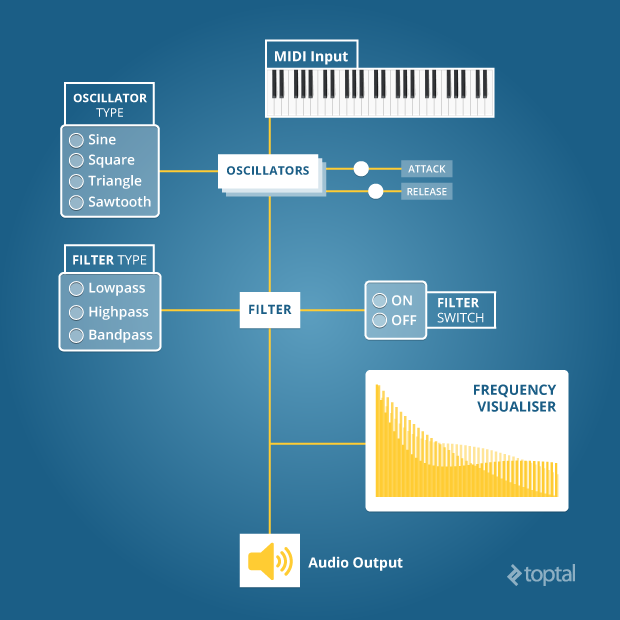 Your onaudioprocess will get called every 2048 samples - which, on a "standard" 44.1kHz audio device, is about every 46 milliseconds (about 21.5 frames per second), and NOT aligned with the 60Hz display refresh. In addition, the onaudioprocess forces cross-thread communications that are unnecessary (since you're not even using the input and output in the scriptprocessor!). You can see how I did this in the AudioRecorder code - https://github.com/cwilso/AudioRecorder/blob/master/js/main.js#L101 is the call inside a requestAnimationFrame-driven function that gets the frequency data. I really dig the way you did the top horizontal scrollbar.